Brake Line Residual Valves are used to keep pressure against brake pads to eliminate excessive pedal travel and create a much firmer and responsive pedal feel. Residuals come in 2lb, 4lb & 10lb. 2lb is recommended for disc brakes and 10lb for drums. Available in Empi and CNC versions. 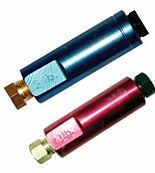 Empi residuals use Std SAE brake line fittings. CNC's use 1/8 pipe fittings. Click Product Options to choose the one you want.